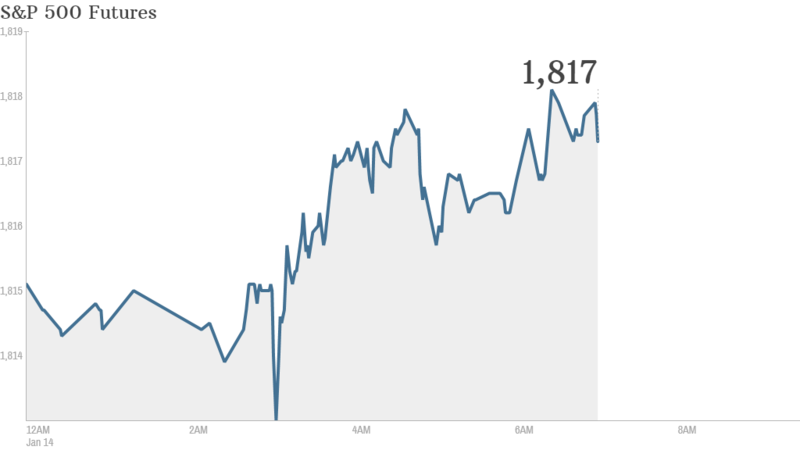 It looks like markets could regain their footing Tuesday after the worst day in three months. a sell-off Monday triggered by jitters about the upcoming earnings season. U.S. stock futures were moving slightly higher ahead of the opening bell. Investors have been nervous that corporate earnings may not be strong enough to justify higher stock prices. The first of the big banks are releasing earnings before the opening bell. JPMorgan Chase (JPM) posted fourth-quarter profit of $5.3 billion, including a $1.1 billion write-off for legal expenses. Wells Fargo (WFC) is also slated to release quarterly results before the market open. This is just the beginning. Investors are readying themselves for a slew of quarterly earnings announcements over the coming weeks. In economic news, the U.S. Census Bureau will release its monthly report on retail sales at 8:30 a.m. ET. U.S. stocks fell sharply as a sell-off gained momentum into the close Monday. Mike van Dulken, head of research at Accendo Markets noted that a new report from Goldman Sachs (GS) said S&P 500 multiples were lofty by almost any measure and further expansion would be difficult to achieve. Market losses were also spurred on after Atlanta Fed President Dennis Lockhart said he would support the Federal Reserve in continuing to taper its stimulus program, provided the economy continues to improve. The Fed's stimulus program -- involving billions of dollars in asset purchases -- helped support a massive stock market run-up in 2013. Google (GOOG) announced Monday afternoon that it was buying connected device maker Nest Labs for $3.2 billion. Also on Monday, Charter Communications (CHTR) said it had formally proposed acquiring Time Warner Cable (TWC). Time Warner Cable flatly rejected the offer. European markets were declining in morning trading. Asian markets ended mixed. The Nikkei in Japan tumbled by just over 3% while the benchmark index in India was up by nearly 2%.